A leading publisher recently suggested that, to avoid causing offence in the global market, writers and illustrators should try not to feature too many pigs, or indeed include too many references to pork-based foodstuffs, in their children’s books. Following their advice, I have just gone to my daughter’s primary school and removed all traces of literature about pigs from the shelves. It took me a while as I had to get rid of all the copies of Winnie the Pooh, Charlotte’s Web, Pig Heart Boy, selected Beatrix Potters, Dr Doolittle, Olivia and many Peppa Pig books. I umm-ed and ahh-ed about Animal Farm and PG Wodehouse’s stories featuring the Empress of Blandings but eventually thought better safe than sorry and got rid of them as well. No copies of Ulysses here so no danger of anyone coming across that scene where Bloom eats a pig’s kidney. But Dennis the Menace’s pet pig Rasher? Afraid he’s gone. Sitting amid the carnage it struck me that an incredibly large percentage of children’s books, from Aesop onwards, feature animals. 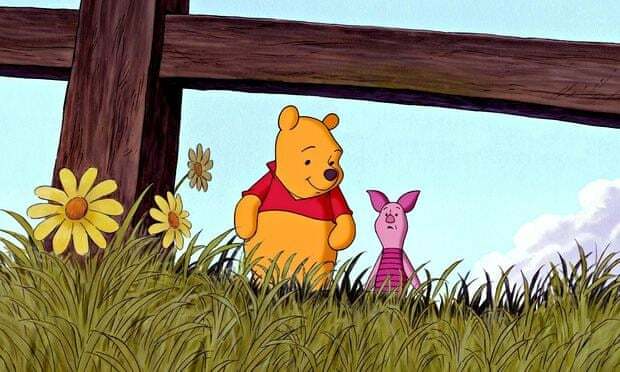 Why are we obsessed with anthropomorphising animals in children’s literature? Why do we do it, and what’s with all the pigs? There is an argument that making animals more “human” will stop us treating them like animals. While it’s certainly true that it’s harder to eat a pig, experiment on a rabbit or wear a fur coat when you’ve read Babe, Watership Down or One Hundred and One Dalmatians, few authors seem to bother writing books about cows, sheep or chickens, and a recent study in Canada found that anthropomorphism is actually bad for animal welfare because it distorts a child’s view of animals. Children coming across an elephant may worry not that he is danger of extinction, but rather that he seems to have mislaid his spats and his green suit. We have also always used animals to convey difficult or complex ideas to children. Subtext and metaphor. Aesop’s Fables and The Just So Stories deliver moral messages that children grasp without realising they are being educated. It’s the spoonful of sugar principle. So The Lion, the Witch and the Wardrobe could be used, if thought appropriate, to simplify Christianity, and Animal Farm to introduce the idea of totalitarianism. And it’s not just adults who do it. Any parent recognises a child saying “but Teddy doesn’t want to go to bed yet”, it’s an instinctive way to deliver a message you know will either be unwelcome, or hard to explain. The death of the clever, generous spider at the end of Charlotte’s Web is devastating, but it’s a way to explain death at a remove. You can literally turn the page. As for why there are so many pigs in fiction, who knows? Actually, for every pig book, I could probably find you 10 about cats and six more about dogs. Whatever the reason, we clearly like using animals to tell stories, so let’s not panic that a depiction of someone either eating or cuddling an animal that is proscribed by some as unclean, might risk alienating a potential audience because “those children are not like me”. Nobody, particularly writers, wants to alienate an audience. Our books are written to be read by as many different people as possible. Books encourage any reader, adult or child, to step outside themselves and imagine life as a different person or creature. The ability to understand what it’s like to be someone else is the goal of all good fiction, and that’s a unifying aim, not a divisive one. After all, what better way to make me, the reader, feel the same as someone from a different country, faith or gender, than by making both of us picture ourselves as a fox desperately digging to escape three farmers who have sworn to kill him? But I must get back to the library: I’ve just remembered that not only does Professor McGonagall feed Ron and Harry chicken and ham sandwiches in Harry Potter and the Chamber of Secrets, but I’ve a sneaking suspicion Bacon may be one of the flavours of Bertie Bott’s Every Flavour Beans. • Harry Oulton is the author of A Pig Called Heather, published by Piccadilly Press.